ICE IS NEVER 100% SAFE! Falling through the ice and into cold water can put you in an extremely dangerous situation. It is important to be extra careful whenever you head out onto the ice. 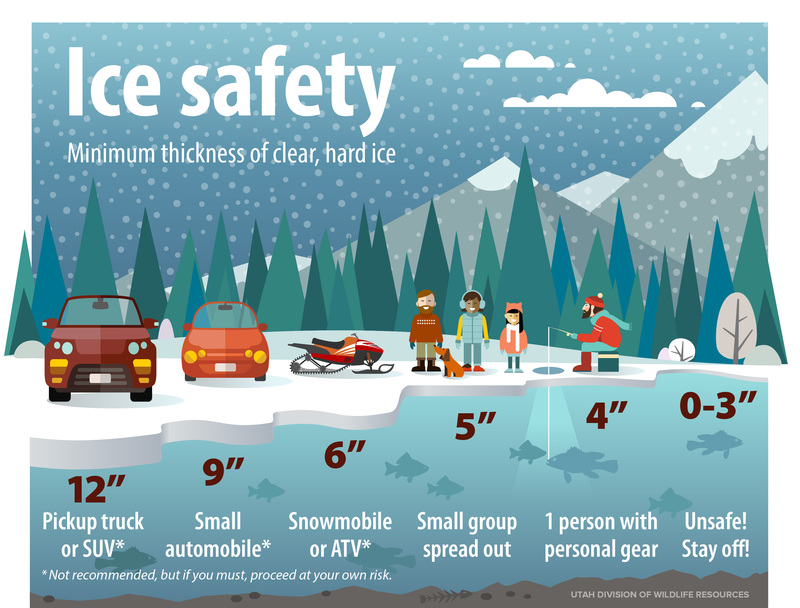 Before planning an ice fishing trip, it is important to consider some ice safety tips to help ensure everyone has a safe and enjoyable time on the ice. Here are some recommendations from us and the Utah Division of Wildlife Resources. Be aware of the ice conditions before venturing onto the ice. These conditions can vary drastically within a few feet and throughout the day. Continually check ice thickness. This is especially important when daily highs and lows are above freezing. Clear ice is capable of holding more weight than cloudy ice. There should be a minimum of four inches of good clear ice before walking out onto the lake, and at least six or more inches before taking a snowmobile or ATV on the ice. Late in the season (March-April) is particularly dangerous as the ice deteriorates. We advise drilling test holes into the ice as you venture onto the ice. Fish with a partner. If you go through the ice it is very difficult to get yourself out of the water without help. Avoid having large groups of people and equipment in a small area. Spread the weight out. Never venture out onto partially ice-covered water. Large sheets of ice can break away leaving you stranded. Avoid the mouths of streams and underwater springs that can create dangerous ice conditions. Carry some safety equipment such as ice awls (picks) for pulling yourself out of the water, as well as rope or rescue throw bag to pull others out. Know how to use your equipment. Life jackets save lives. It is a good idea to wear a life vest under or over your clothing. Dress warmly. It can be extremely cold, particularly when the wind blows. Be careful if you attempt to rescue a person. Use a rope or a long pole only to attempt to rescue. DO NOT go in the water or near the victim. Many would-be rescuers become victims as well when getting too close. Always let a friend or family member know where you will be and when they should expect to hear from you.